CHURCHROCK – Decades of uranium mining during the Cold War have transformed Annie Benally’s life-long home on the Navajo Nation into a moonscape of giant earthen piles contaminated by radioactive dirt and rock pulled up from deep shafts. Evidence of past efforts to remediate contamination pock the landscape along Redwater Pond Road near Churchrock, where Kerr-McGee Corp. and United Nuclear Corp. operated two of the nation’s largest uranium mines in the 1970s and 1980s. Navajo Nation officials say they are hopeful that a ruling handed down in December by a New York judge will provide up to $2.4 billion to clean up the former Churchrock Quivira mine and 48 other abandoned uranium mines once operated by Kerr-McGee Corp. in New Mexico and Arizona. In his ruling, the judge found that Kerr-McGee had fraudulently shifted its liabilities to another company to make Kerr-McGee a more valuable to a buyer. The judgment would also provide funds to clean up the Shiprock Mill, a massive uranium processing site in Shiprock. Benally said years of patchwork efforts to fix uranium contamination at Churchrock mine sites have made her and her neighbors skeptical that a lasting solution is forthcoming. Current plans call for Redwater Pond Road residents to move from the area in 2018 while contamination at one of the two giant mine sites is moved off site. Benally points to a gravel road made of tons of discarded uranium ore. Two years ago, a private company tried to clean up the contamination. Benally and her neighbors believe the dust that blows off the huge piles of radioactive material left from more than a decade of mining activity in the 1970s and 1980s is causing health problems for residents and their children. On Dec. 12, U.S. Bankruptcy Judge Allan Gropper of the Southern District of New York ruled that Anadarko Petroleum Corp., the parent company of Kerr-McGee Corp., owes damages ranging from $5.2 billion to $14.2 billion to the Navajo Nation, at least a dozen states and other claimants across the U.S. stuck with environmentally damaged sites. The U.S. Department of Justice estimates the Navajo Nation’s share of the judgment at between $880 million and $2.4 billion. A lack of funding has for decades stalled the reclamation of abandoned uranium mines and mills that shed radioactive waste into the environment, he said. About 20 percent of the final settlement amount will be paid to the U.S. Environmental Protection Agency to pay for cleanup at 50 former Kerr-McGee sites in New Mexico and Arizona, including the Shiprock Mill, Taylor said. The precise amount of the settlement will be determined by ongoing litigation in the bankruptcy case. Anadarko Petroleum did not respond to requests for comment this week. The company has said it contests Gropper’s ruling and plans to appeal. John Hueston, a Los Angeles attorney who represents the Navajo Nation and other claimants, said he expects litigation to continue for at least a year. “I can say on behalf of the beneficiaries that they are willing to stand and fight because of what’s at stake and because of the size of the victory,” Hueston said in a phone interview. The scope of Kerr-McGee’s uranium operations on the Navajo Nation offers a variety of monumental cleanup challenges. 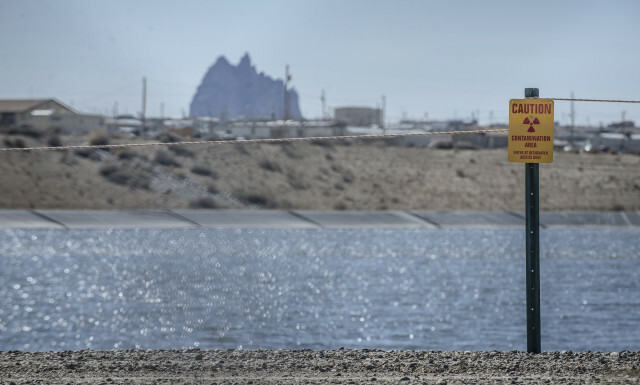 Kerr-McGee processed uranium ore at its massive Shiprock Mill, where a 1.5 million-ton tailings pile looms over the San Juan River, within a few miles of Shiprock’s 8,000 residents. And about 40 miles southwest of Shiprock, near Cove, Ariz., miners tunneled more than two-dozen Kerr-McGee mines into the rugged Lucachukai Mountains, some in areas so remote that access by vehicle is difficult and dangerous. Overburden from the mines was trucked into the valley where today it forms huge piles in the Cove community. Alberta Tsosie, whose father died at age 45 after working in the mines, contends that water from the mines flows into the valley, poisoning livestock and wildlife. Absent from the list of Kerr-McGee claimants is the state of New Mexico, Heuston said. He does not know if New Mexico tried to file a claim in the bankruptcy. Kerr-McGee operated uranium mining and milling operations at Ambrosia Lake near Grants from the late 1950s until 1988, according to a corporate prospectus. Activists say they urged state officials in 2009 to file a claim in the bankruptcy to seek funding for remediation at the site. Bill Brancard, general council for Energy Minerals and Natural Resources Department, said that Rio Algom became the owner of the Ambrosia Lake operations when it purchased the Quivira Mining Corp. from Kerr-McGee in 1989. State officials determined that “there were no significant liabilities out there associated with Kerr-McGee under our laws,” Brancard said Friday. The New York bankruptcy case centers on a chemical company called Tronox Inc., which was spun off by Kerr-McGee Corp. in 2005. In 2006, Kerr-McGee was acquired by Anadarko Petroleum. Tronox Inc. filed for bankruptcy in January 2009. As part of the bankruptcy proceedings, Tronox and the U.S. Department of Justice filed suit against Kerr-McGee. The lawsuit alleged that Kerr-McGee fraudulently transferred to Tronox billions of dollars of environmental liabilities to increase Kerr-McGee’s value to Anadarko. In his ruling, Gropper agreed that Kerr-McGee’s actions were fraudulent and left Tronox insolvent. “Kerr-McGee was trying to cleanse their crown jewel assets – the oil and gas assets – of all the environmental liabilities, which made Kerr-McGee an unattractive acquisition up to that point,” Hueston said. The 50 Navajo Nation sites included in the Tronox settlement include the Shiprock Mill site, which contains an estimated 1.5 million tons of tailings left by the processing of uranium ore, Taylor said. The remaining sites are abandoned uranium mines. The sites included in the Tronox settlement comprise only a fraction of the estimated 521 abandoned uranium mines scattered across the Navajo Nation in New Mexico, Arizona, and southern Utah, he said. The scope and cost of the cleanup will depend on the volume of material found at the sites, which remains largely undetermined, Taylor said. “You never know what the final volume is until you get out there and start digging almost,” he said. A five-year plan completed last year provided an “initial rough survey” of abandoned uranium mines in Navajo country, with some estimates about the amount of material they contain, he said. Before cleanups can begin, officials first must characterize the sites, which will require years of work, Taylor said. The EPA, the Navajo Nation, and corporations have performed some remediation at several sites. The Churchrock Quivira Mine site is further along than any of the Tronox sites, Taylor said. “Even there, there has been no final decision about what the remedy will be,” he said. But Taylor said the Navajo Nation and the EPA believe that a final settlement in the Tronox case will allow sites to be fully cleaned up. The Tronox sites include 11 mines in the nation’s Eastern Agency, located northwest of Grants, he said. The Eastern Agency sites include the Churchrock Quivira mine, located about 15 miles northeast of Gallup, which contains about 100,000 cubic yards of contaminated material, Taylor said. The remaining 38 mines are located in the Navajo Nation’s Northern Agency, which straddles the Arizona-New Mexico border. Of those, 10 mines lie in New Mexico and 28 in Arizona, including the Cove area mines, he said.